Wusthof, Wusthof, Wusthof!! 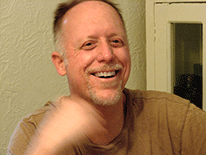 I’ve got Wusthof knives on the brain. . .mainly because I’ve been working on a definitive article to add to the KitchenKnifeGuru website that should cover everything Wusthofian. Weeeell, let’s not get carried away, but at least it should offer shoppers some serious guidance to help them wade through the merchandise. 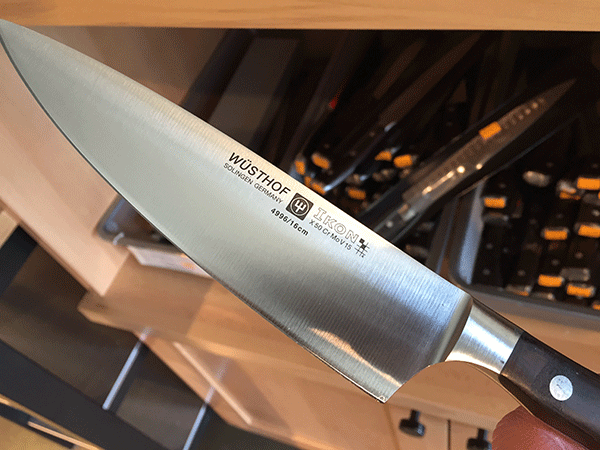 Working title: Wusthof Knives—a Buyer’s Guide. Sound good? 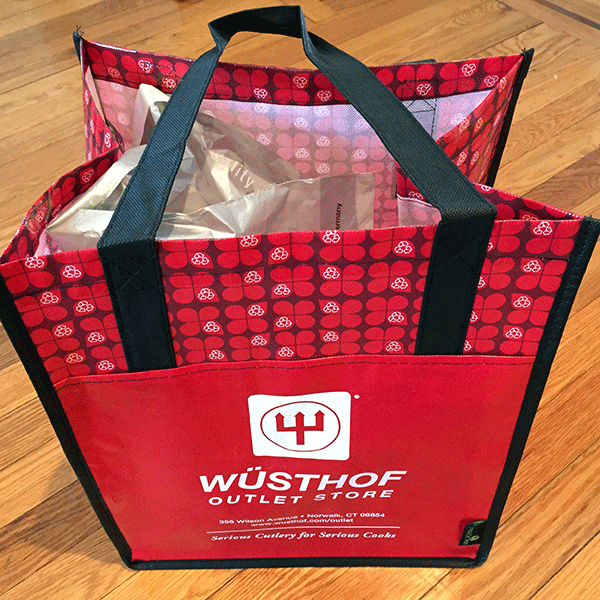 Anyway. . .in final preparation, and more importantly, to actually feel in my grubby mitts just how the various models function in the real world (I only own one measly 3 1/2 inch Wusthof paring knife for heaven’s sake), I took a field trip to the Wusthof Outlet Store in Norwalk, Connecticut. Wow—what a discovery! 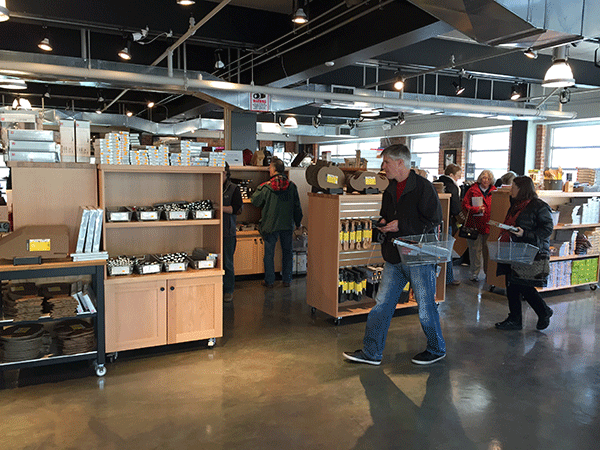 CLICK HERE to scroll down to the outlet store’s address, phone, and email. The story of my visit. . . 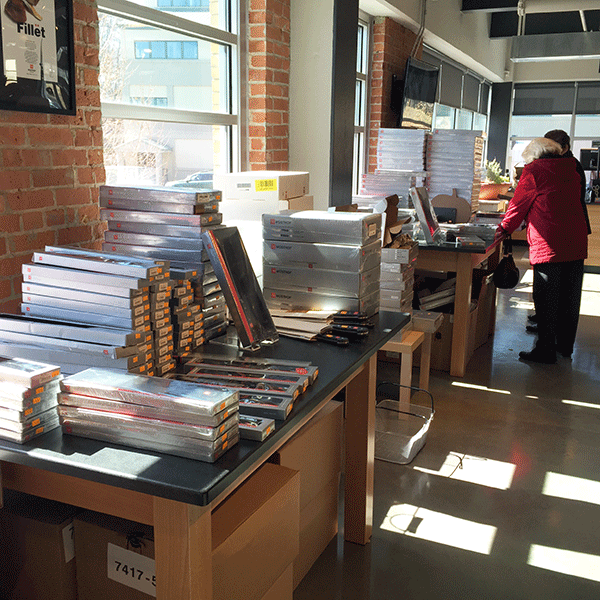 This special inventory sale ran for three days—Thursday through Saturday. I didn’t know what to expect, so I played it safe rather than sorry and drove there Thursday morning, arriving around 11:30 a.m. The smallish parking lot was already pretty darn full! The outside entrance is a little mundane. But once you step inside. . .presto chango! 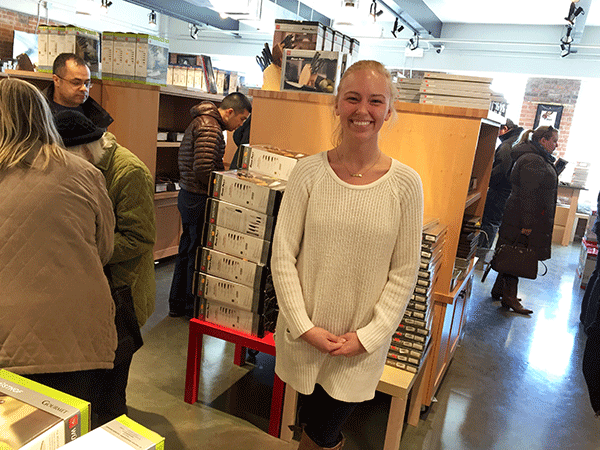 The store was abuzz with shopping fever and at first I was kicking myself for not getting there earlier. Were they going to run out of all the good stuff by noon? Choices, choices, choices! 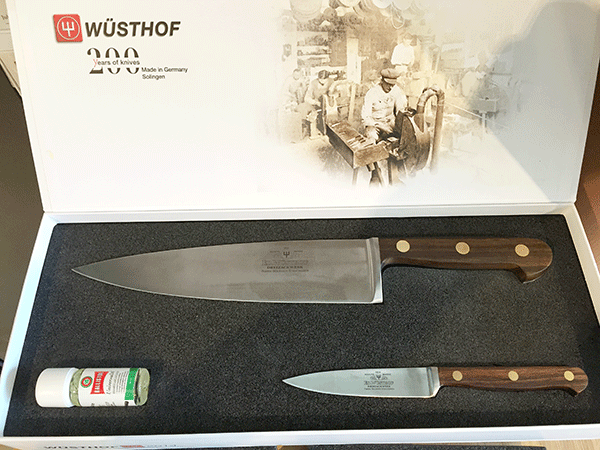 I, of course, was only interested in my two favorite high-quality forged lines: Wusthof Classic and Wusthof Ikon. 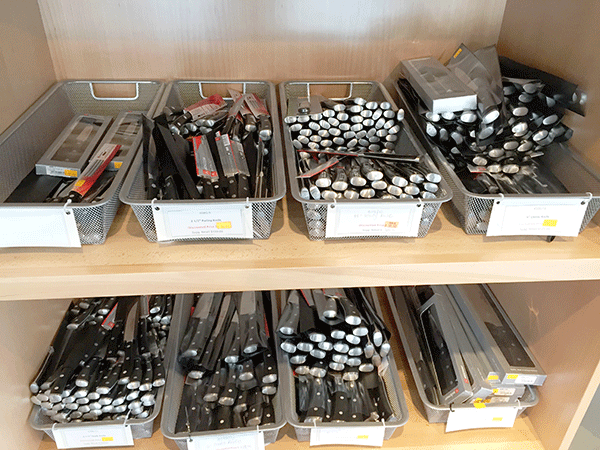 When I saw the bins and bins of chef knives (knives that go for $125 and up online, slashed to half), I began to breath more easily. There would be plenty for all. 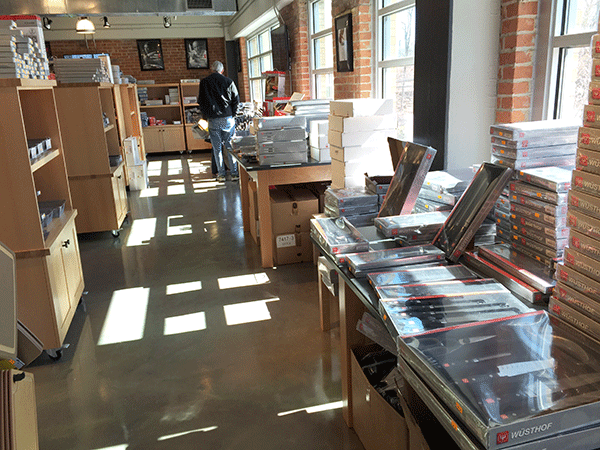 The bins below are full of 8- and 9-inch Classic Ikon chef knives. Out there in the retail world each one goes for $150 and up. Not in here in Wusthofland. More like $85 (plus 20% more off at the register). For the first half hour, I still kept having to calm myself down because there was such an array of gorgeous knives at fire-sale prices!! I couldn’t get used to it. I scooted over here, over there, and over here again (pretty much like everybody else) and stuffed my little shopping basket fuller than was financially viable. But after a while I finally began to acclimate and enjoy myself. BTW—for more info about Wusthof knives and what models I recommend and why, be sure to check out my article, Wusthof Knives—a Buyer’s Guide, on the KitchenKnifeGuru website. 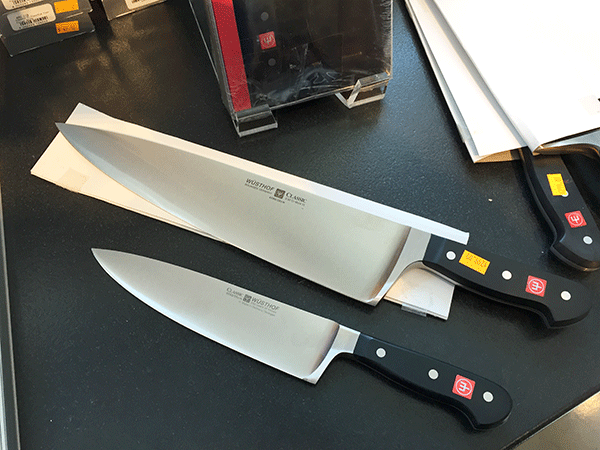 The next photo just reeks of kitchen knife lust: Wusthof’s Anniversary 2-Piece Knife Set. Natural wood handles with brass rivets. Carbon steel blades (not stainless). 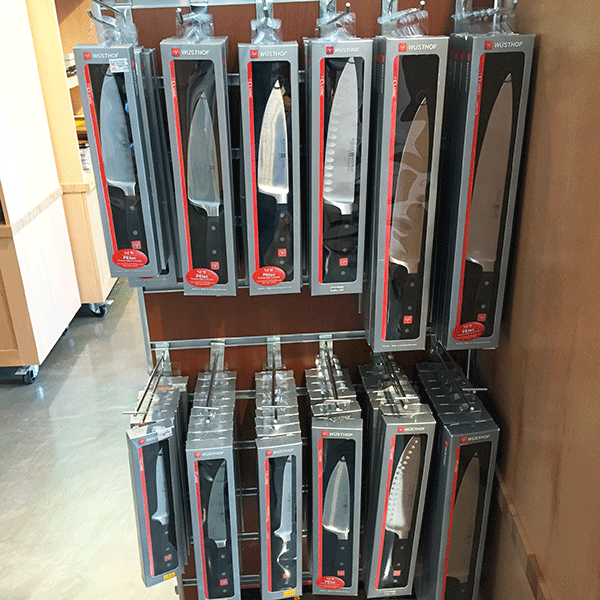 I thought they were “interesting” until I picked up the 9-inch chef knife. Oooo. It felt like it was made for my hand. Perfect grip and perfectly weighted. Balanced, substantial, but not too heavy, which is saying something for a 9-incher. And I loved the shape of the blade which is a bit wider than other Wusthof 9-inchers and gives you more to scoop with. Yes, because it’s carbon steel, you cannot be casual about maintenance and leave it out on the counter to air dry or it will sprout an ugly orange-brown film on the blade otherwise known as rust. Only $129 versus the usual $200. 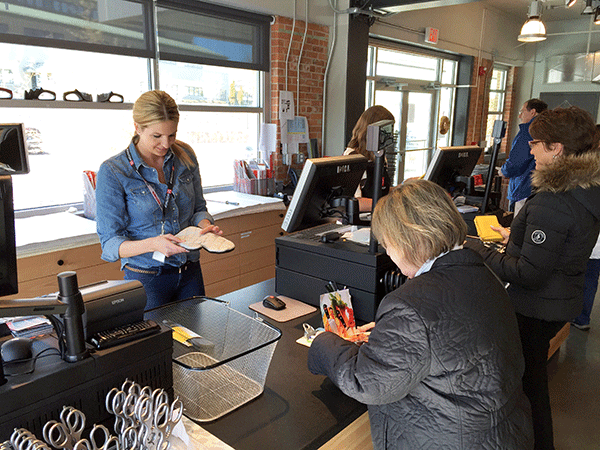 And that didn’t even include the additional 20 percent they snip off at the register during special sale promotions like this three-day March bonanza. I finally dragged myself away and continued my odyssey. Where you going to put them all? I bought one of these with 17 slots for around $20. Do you eat a lot of crusty bread and are you sick of your bread knife sliding all over the place before it digs in? 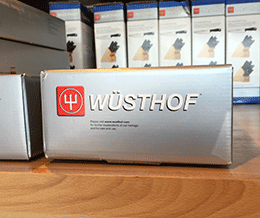 Wusthof makes a double serrated bread knife that, Angela explained, rips crust like a wolverine. “Double” because there are smaller, mirco-serrations sandwiched between the larger ones. (See below, lower right.) This puppy made it into my basket, but not the final cut. We don’t eat enough baguette these days to quite justify it. One of the ones that got away. . .
You want big? The smaller of these two blades is a standard 8-inch chef knife; the larger must be for filleting a Brontosaurus, or chopping up heads of cabbage for, literally, an army. 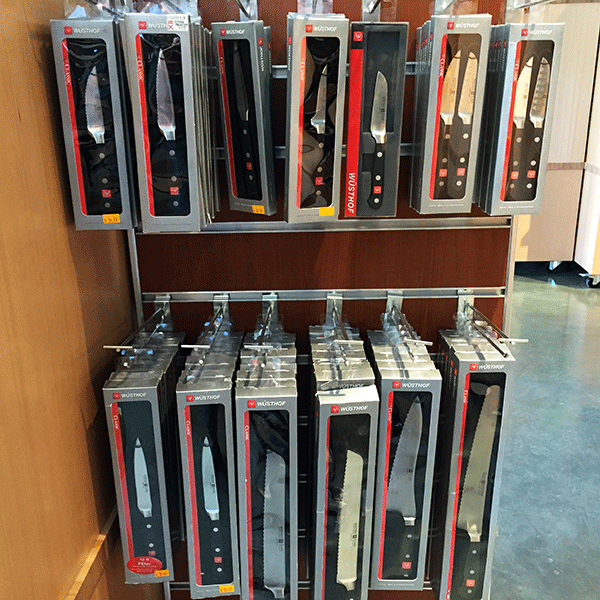 But it gives you a sense of the full range of Wusthof knives, one for every occasion. 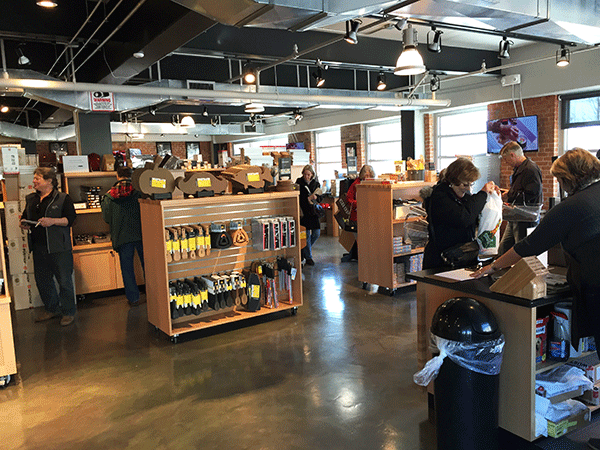 Although I pretty much knew what I was looking for and looking at, over and over again I overheard the knowledgeable staff advise and steer customers in the right direction toward the right Wusthof knife for them. 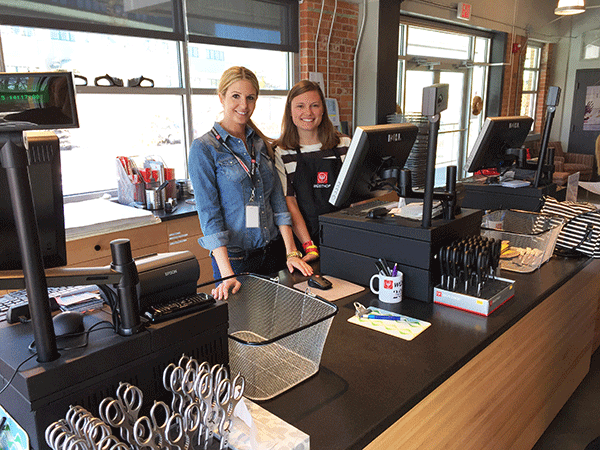 Guess where the tall, lovely blonde sales clerk is from? 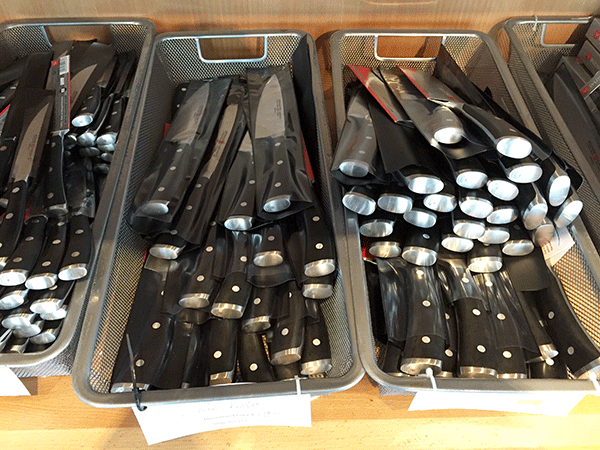 (The same country as all these Wusthof knives, ha-ha!) So a propos. 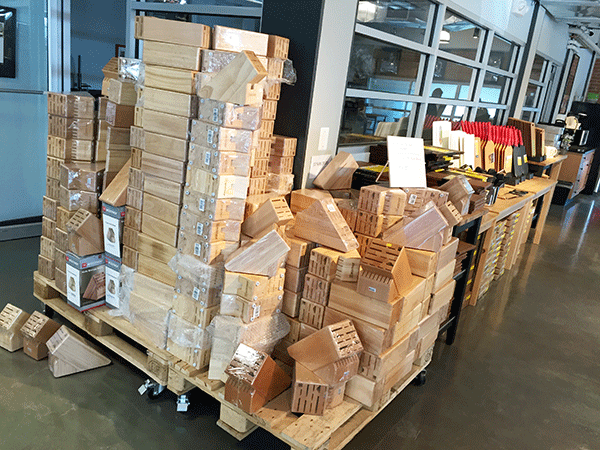 Evidently, the amount of inventory can vary greatly, but there’s always something. 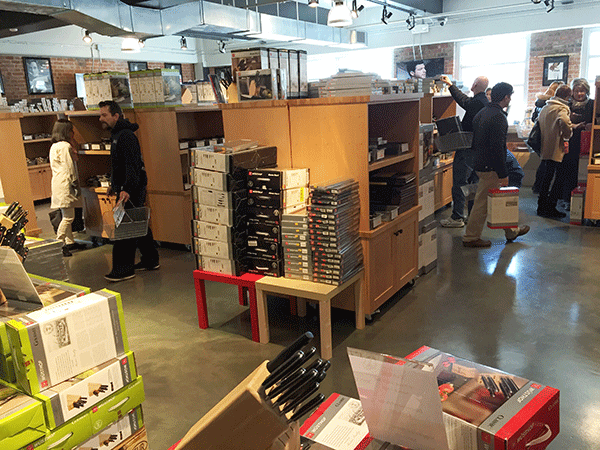 This time around was unusually bountiful which included a wide range of products as well as quantity. It’s not always so. – oh, and of course, a new knife block to fit them all in. When my sister-in-law heard I spent an afternoon shopping for knives, she chuckled about the hilariously eccentric man her sister married. And perhaps tis true. But, in the end, I’d like to think it’s more about the whole kitchen experience. 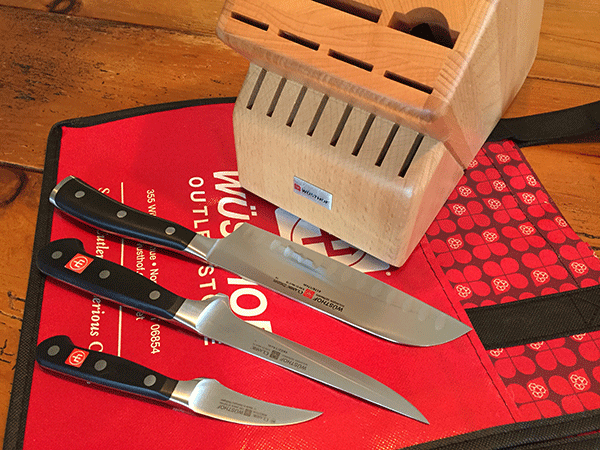 If you love to cook, then sharp, well-designed knives are your bosom buddies. They make it much more fun! P.S. 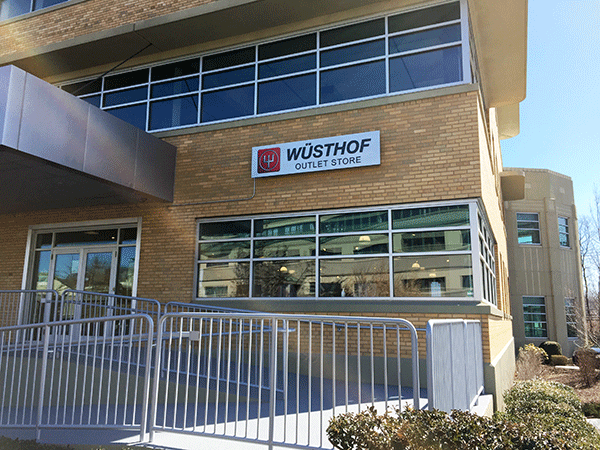 Wusthof also sharpens knives on the premises (whether they’re made by Wusthof or no) for a flat fee of $2 per knife. Hello, my name is Cheri, from Oklahoma. Is there any way you can help me buy a few of your Wusthof knives for my husband for Christmas? My husband has had Wusthof knives before, but lost everything in a house fire two years ago. Please feel free to follow-up with any more questions!